Ariel Sharon has died. He had spent 8 years in a coma following the stroke he suffered at the height of his power in 2006 when he was the serving Israeli prime minister. He will leave a bitterly divided legacy, with some seeing him as a tireless defender of Israel and others remembering him as a war criminal. He was one of the last iconic figures of Israel’s founding generation. He fought in the war of 1948 and remained a military man for most of his life. For many he epitomized the fearlessness and bravery needed to protect Israel as its enemies circled, and he was a hero of the Six Day War in 1967 which saw Israel defeat Egypt, Jordan and Syria. He is credited with a major role in wresting the Sinai from Egypt and has been known both as ‘The Lion of God’ and – somewhat more ambiguously – as the Bulldozer. During the war with Lebanon in 1982 however, his role in the massacre of Palestinians by a Lebanese Christian military at the Sabra and Shatila refugee camps led to an altogether darker notoriety. It did not however preclude his political rise, and he became a leading figure in the Likud party. Known as a hardliner and a fervent supporter of the profoundly controversial settlement project, he finally became Israel’s Prime Minister in 2001 after the right wing Likud party chose him over Benjamin Netanyahu. His premiership courted controversy from the outset as he paid a visit to the Al Aqsa mosque during the Palestinian intifada, ratcheting up tensions and seemingly setting the tone for a deeply adversarial period. Elected on a promise of security, Sharon dismissed any thoughts of a bilateral peace process, and set about a series of radical measures including the building of the profoundly disturbing separation wall in the West Bank. 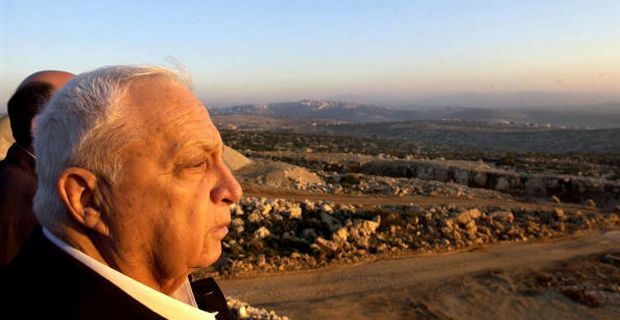 It was Ariel Sharon that pulled both settlers and troops out of the West Bank. Some see this as a step toward reconciliation and wonder what might have been had he not been struck down by his stroke. Others see it as a deeply cynical move to expand settlement in the West Bank and turn Gaza into a giant prison camp. Many of his former allies on the hard right and settler groups bayed for his blood over the perceived ‘betrayal’ of the Gaza withdrawal, and with his own party split, Sharon left Likud to form the Kadima party. Was Sharon genuinely seeking peace toward the end of his life or was he just re-assessing occupation tactics? We shall never know. His body is set to lie in state at the Knesset, the Israeli Parliament today.